As soon as I saw the gorgeousness of Emily A. Clark’s painted kitchen cabinets, I knew I had to do the same thing to ours. She took off her cabinet doors and painted the back wall Urbane Bronze by Sherwin Williams. You can read her full post here. Doesn’t that look great?! I chose to paint the cabinets in our kitchen that already have glass doors. I’m not sure what you’ve got going on at your house on Friday nights, but two Fridays ago, after James went to sleep, this was what I was doing . . . I taped the sides, applied two coats that night and a third coat in the morning. 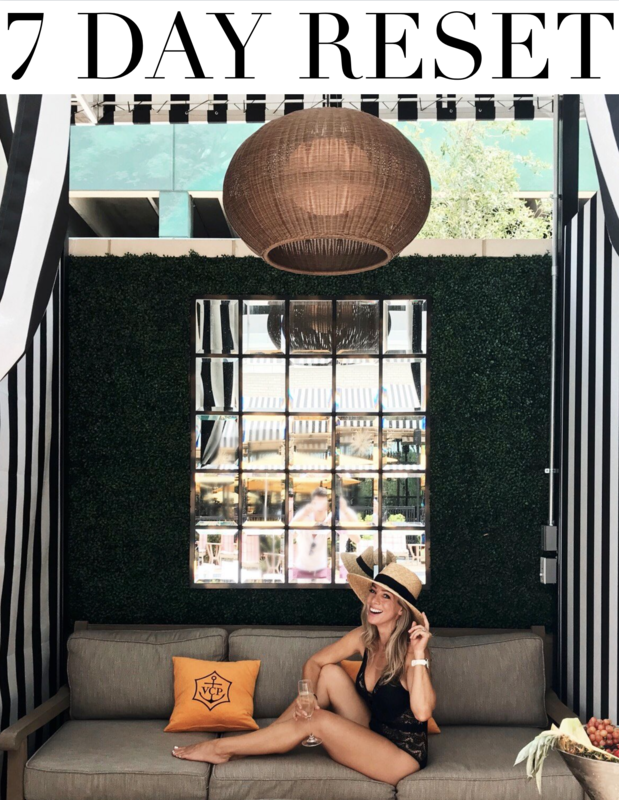 I used the same paint color as Emily- Urbane Bronze by Sherwin Williams. I used flat paint (because our cabinets are flat) and she used satin (that’s what she had on hand). The picture below was taken just after the third coat was painted, while it was still wet, and it dried darker than that photo depicts. The photos with the dishes in the cabinet show a truer representation of how the color looks dry. After putting everything back in, I realized I needed all white dishes and pottery, because the cream and olive green dishes I previously had in there didn’t look too good with the dark grey background. So, I ended up relocating those dishes to another cabinet and added in more white. You can read more about the “before” HERE. I love how the white pops against the dark background. Too keep it from being too stark, and to add a touch of fun, I brought in a couple mini potted boxwoods. (I also cleared off the area underneath to keep the focus on the pretty cabinets). I bought the tall pitcher at Target and the two smaller pitchers at Homegoods. You can also get them really cheap here . I’m terrible at eyeballing how things will look, so I am one of those who purchases, tries it out at home, then returns. (I originally had three tall pictures, but liked the balance of one large and two smaller, so the two large ones went back to Target). The two large bows were also from Homegoods and the coffee cups are from Target- nice and tall so you can see them with the doors shut. We already had white plates, small bowls, and the cake stand. I could have just spray painted some off-colored objects, but I didn’t have the size and shape I wanted. Because we have doors on our cabinets, I had to keep the items inside centered so they looked nice when the doors are closed. I love how the cabinets turned out and only wish I had painted them sooner! Thank you Emily for the inspiration. 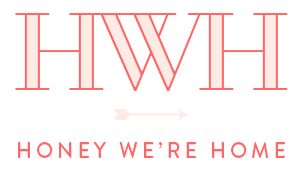 I know it’s back to school for many of your households- hope you and your kiddos have a great week! This looks great!!! 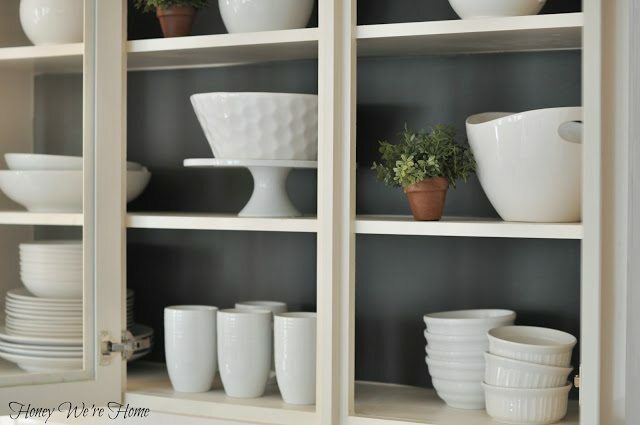 I love all white kitchens and that grey looks so good with your white cabinets and white dishes. Great inspiration!!! I love it! 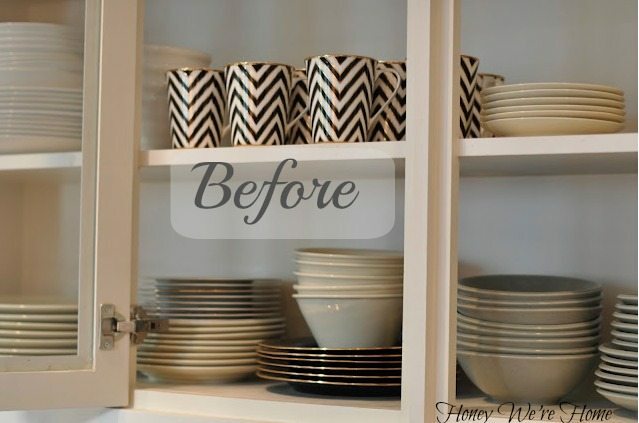 With your white cabinets the color pops and it looks like a whole new cabinet! Great job! This is gorgeous! I love the color. I also love how the white dishes look with the dark grey background. I would like to say that my husband and I are partying it up on Friday nights, but that doesn't happen here either, don't feel too bad. This looks incredible! Love, love, love it! Oh my gosh LOVE! Love. Love. Love.!!! Loooove it!! Omg! Can we be best friends? You and I would get along so well. I loooove those chevron coffee mugs. Sooo neat. I love it! Great color contrast and love the all white dishes inside! I love the color and think your white dishes look great against it. I am also glad you didn't remove the glass doors on your cabinets. They are so pretty and definitely fit with the style of your house. Love it. I've been contemplating painting our kitchen cabinets for years. Just haven't gotten up the nerve to do it. I tried painting the guest bathroom cabinets and it turned out horrible. I'm hoping that over time and reading a ton more tutorials that I have honed the technique but it still makes me nervous to do it. Wow, what a difference! The colour contrast really makes your pretty dishes stand out, it looks gorgeous! It looks great! My new house has glass front cabinets. I was thinking of painting the back a similar color-BM Kendall Gray! Great inspiration for you and Emily! 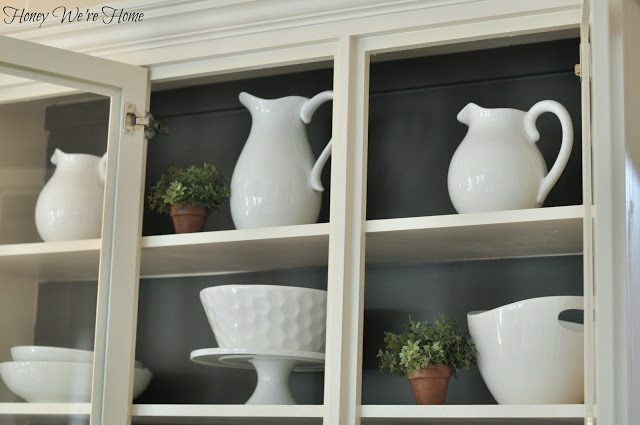 Love the darker color & how you styled the cabinets! Oh and I also love those chevron mugs. Gorgeous! That looks amazing! I wish I had glass cabinets! Maybe I will try that on our entertainment center?! it really makes a difference! you did a great job styling them too! Crap. This makes me want to paint all of our cabinets white 🙂 I love the way yours turned out, and I think I need to add a little green to mine, now, too. Thank you! I like how you added glass accents, worked better for you since you don't have the glass doors. It looks great Megan. Isnt it amazing how something so little can make such a difference? They look beautiful! Love the contrast! Looks great. Love the painting outfit. 🙂 I think my favorite item in the cabinet is the honeycomb design bowl. I like the way you styled the cabinets! Love the idea of painting the backs that dark color. Emily has such great ideas! Such a party animal on a Friday night lol. Sounds like fun to me! It looks beautiful! The grey really adds a lot of beautiful depth. BEAUTIFUL! I love the pop of color. It looks so pretty! 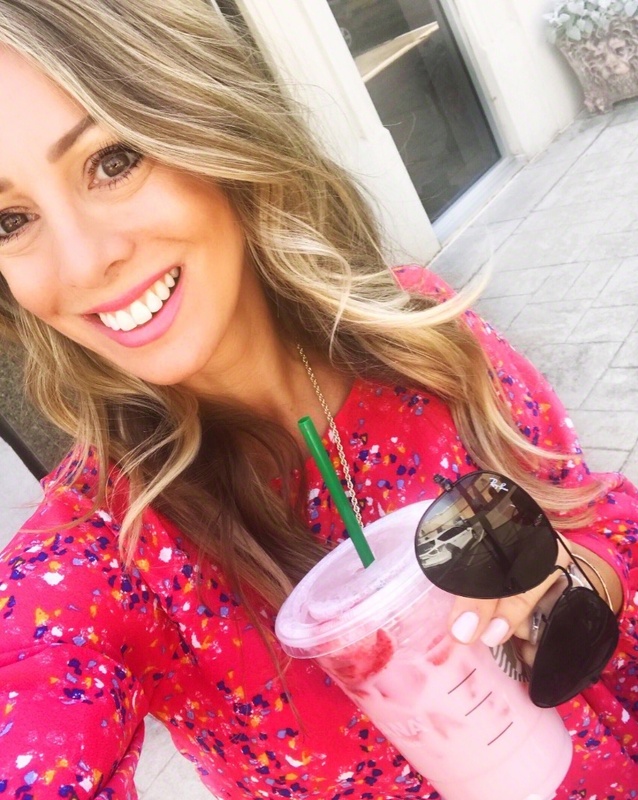 Where did you get your chevron coffee cups? Now I want to just rip out my cabinets and start all over. Looks great!! The black background looks amazing!! Definitely a showstopper! Wow! I can't believe the difference that makes! Looks fantastic! This makes such a dramatic difference and makes the white pop! I so want to change over to white dishes. It just looks so clean and crisp! Beautiful job! The cabinets look great! I love the white pitchers & the big bowl. The chevron cups are from Mikasa. Fab, Megan!! It really pops the white bowls. Great project!! Fantastic!!!! They look amazing!!! I love the white pop! Omg this is fabulous! I love the color with the white dishes, BEAUTIFUL! Megan, Absolutely beautiful! 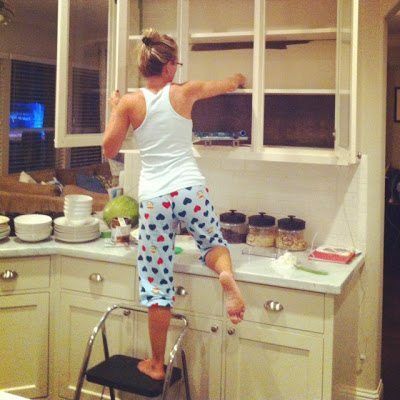 I'm a big fan of Emily's (she designed my kitchen, which I'm in the process of implementing now), and I love that you used her cabinets as inspiration. 🙂 Yours look amazing! I absolutely love how it turned out! I think that the Urban Bronze looks fabulous against your cream cabinets! Thanks for the inspiration lady! I love, love, LOVE this look! A small project that makes big impact! Beautiful! Wow, that looks awesome. I do like it a teeeny-tiny better with the doors open aka without the doors though. So the tall middle pitcher from Target isn't cut off when the cabinet door is closed..why not bring that pitcher down one shelf and add the cake stand in the top middle shelf? Or maybe you tried that and the tall pitcher doesn't fit in the middle center shelf? Other than that..it looks great! 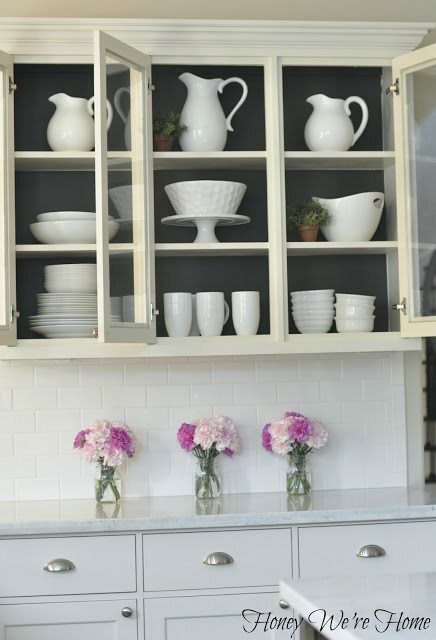 I have never seen painted kitchen cabinets before but I love the idea. Are you on Pinterest? Wow!! This look absolutely incredible. 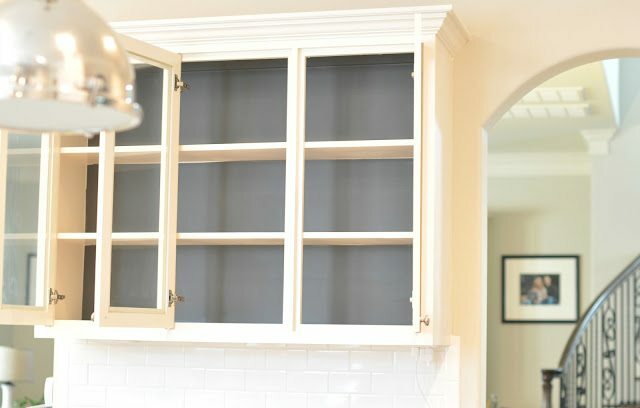 I have one open cabinet in my kitchen and considered painting the back a dark navy, but was worried it would look like a black hole floating above the gray cabinets. You are proving me way wrong here! That is gorgeous. I have one glass double cabinet like that in my kitchen too. I am DOING THAT. Can I ask a question? I love the look of flat paint, but how do you wipe down the cabinets? Is it a special type of flat paint?Everything I've read says to use semi-gloss or eggshell at the very least in a kitchen as flat paint will wipe off. Any info you have would be great! I use any kitchen cabinet cleaner or dishsoap and water. The paint hasn't wiped off, but we only used flat because our builder recommended it as more modern?? I think semi-gloss or eggshell in the kitchen would be fine too. Looks great! I loved the chevron ones but I can't ever resist a lot of white, either. I really like the contrast. 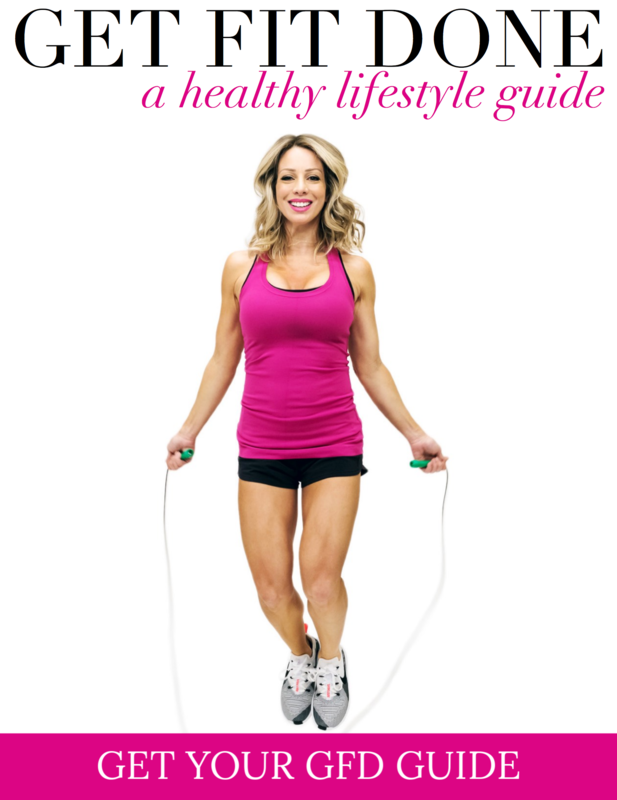 Also, you look great – you're so in shape! I've been working full time and going to law school for four years so I've got 20 lbs to lose after the Feb bar exam 🙁 I'll def be revisiting your post about your meals and workout at that time, and probably again whenever I decide to have a baby in a year or two. Haha. Oh my! Those don't even look like the same cabinets! Such an incredible difference, I am always impressed what a little paint can do. The white dishes really make a statement now. Consider my jaw dropped! it's so timely that I've come across this post! I follow Emily too but missed the color she used. 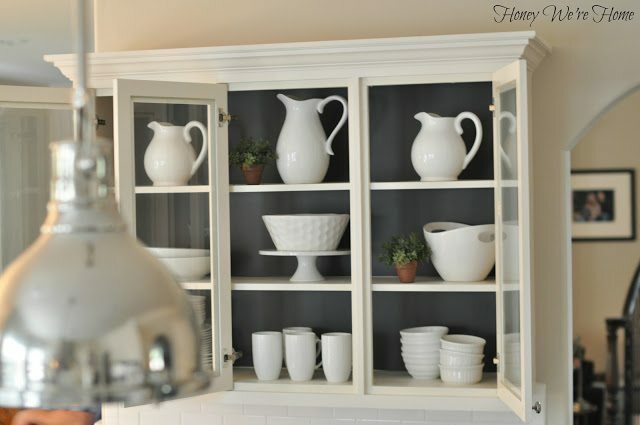 I've been wanting to paint the backs of my glass cabinets a grey color too and I'm going to steal the exact same gray ya'll used (in flat as you did). I'll let you know how it turned out! I have this color on my exterior doors and I LOVE it! I painted all of our exterior doors this color and I LOVE it! It looks really nice. What about adding the chevron mugs at the bottom where the white ones are? I think it will help to break up all the white. Just my two cents. 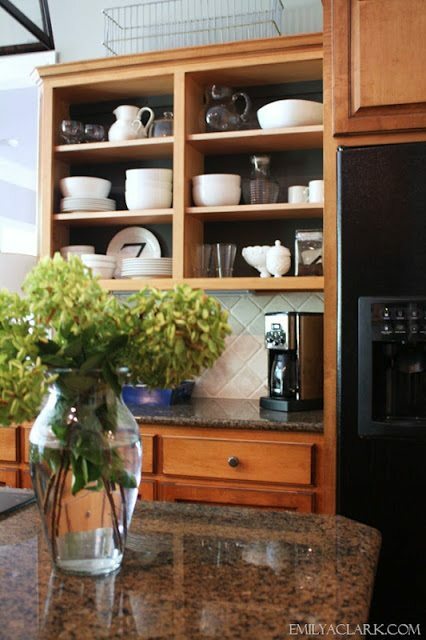 That kitchen cabinet and the overall arrangement is well organized. This is what the kitchen should be. Wow those look great! I found some great handmade cabinet knobs too that i thought I might share. The Kitchen idea it looks so nice and neat. I believe that no room in the house has changed more dramatically over time than the kitchen. What a fabulous job! It looks great! They look better than the original, i recently painted my kitchen cabinets but i chose black color to match the flooring and countertop. Love this DIY! Gray is one of my fav colors to work with now so that is awesome to see! Love how is came out and it really makes your dishes stand out. What color are the bottom cabin just white or are they light grey? I was looking for white color kitchen cabinets and wanted to know, what color did you use for your kitchen cabinets. They look beautiful. I love that you painted them white, they look awesome! I want to get some Halifax kitchen cabinets installed and then paint them turquoise but my wife is unsure if that color will work in our kitchen. We will see. Thanks for posting! These cabinets look great! I have been thinking of ordering rta cabinets online… But I may just paint my old ones! Love these! I'm building a home and trying to make sure I like my paint colors. I am thinking of using Divine White and Kilim Beige as the trim and wall colors. I love the coastal look when people do the walls one shade lighter than the cabinets, but I cannot decide if I'm brave enough to do that. I'm used to my walls being saturated with the color Latte. I love this post b/c my designer told me to use Urbane Bronze for my shutters and stuff outside. I have built-in cabinets in the living room and she suggest I use Dorian Gray on those and the kitchen island. I wonder what your cabinet color is in the kitchen? What is your wall color? This post is such a blessing to me. I just typed in the color Divine White hoping to see what it looks like on cabinets!